An advanced, high potency formula to provide nutritional substances to facilitate the repair and maintenance of the protein structures of your body. Repair Tonic can be regarded as a general tonic, especially from middle age onwards. This formulation has been designed to supply high levels of nutrients to repair collagen. Research and experience suggests that higher levels of Glucosamine, plus Chondritin Sulphate produces more thorough healing, of arthritis than lower dose formulations. Collagen disorders are related to a wide variety of health issues. Note glucosamine is derived from the shells of shellfish while the allergen (Wikipedia Reference) is within the flesh of the animals, it is probably safe even for those with shellfish allergy. Maintenance use: 3 capsules twice daily. Intensive use: 3 capsules 3 times daily. Take on an empty stomach or just before a meal. An advanced, high potency formula to provide nutritional substances to facilitate the repair and maintenance of the protein structures of the body. This formulation can be regarded as a general tonic, especially from middle age onwards. By supplying a mixture of nutrients, a variety of health disorders can be mitigated, and often reversed. (Depending to some extent on the lifestyle and diet choices made to facilitate the overall improvement of health - please refer to our Dietary Guidelines for overall nutritional and dietary advice). Circulatory disorders, involving the common pathological processes of aging, such as hardening of the arteries, high blood pressure, and helping prevent blockage of the arteries, stroke and common disorders of the heart, usually associated with aging. Back pain / problems, spinal weakness etc. due to weakness & inadequate lubrication of the intertribal discs. Bone disorders, such as osteoporosis, soft or weak bones. Research suggests that higher levels of Chondroitin sulphate and Glucosamine produce a more thorough healing of arthritis than lower dose formulations. Designed to supply high levels of nutrients to repair collagen, Collagen disorders are related to a wide variety of health issues. Note: Glucosamine is derived from the shells of shellfish while the allergen (Wikipedia Reference) is within the flesh of the animals, it is probably safe even for those with shellfish allergy. Seagreens - (Ascophyllum Nodosum) delivers virtually every nutrient (vitamins, minerals, protein, fibre micronutrients, etc) in significant, balanced amounts and can be taken safely on a permanent basis. The only supplement to contain Nature's full quotient including rare trace elements including gold, platinum and silver. Propolis aids circulatory health in a significant manner - partly due to the presence of bioflavenoids. Chinese researchers have found propolis effective in treating hypertension, arteriosclerosis and coronary heart disease. Serrapeptase has wide clinical use, spanning over twenty-five years throughout Europe and Asia, as a viable alternative to salicylates, ibuprofen and the more potent NSAIDs. Boron is an important trace mineral that has largely been ignored for health maintenance and freedom from disease. This is unfortunate, as it is extremely important and as a health supplement, can have profoundly beneficial effects. The addition of chondroitin further strengthens collagen throughout the body, including arteries, joints, bones, and as mentioned previously all cellular support tissue. A formulation containing chondroitin, lysine, proline, and vitamin C is useful in helping prevent and treat coronary infarction, stroke and circulatory disorders in general (including high blood pressure) according to the research of Dr. Matthias Rath, M.D. Vitamin D3 is the sunshine vitamin. Sunlight exposure on the skin causes production of vitamin D. It's main role is in aiding mineral absorption, especially calcium -without which, health can never be optimal. Sufficient calcium absorption effects all areas of health including cellular pH - the level of acidity/alkalinity in the cells and tissues. A slightly alkaline pH of the cells and blood is a prerequisite of long term health. Conversely, long term sickness parallels the degree of excess acidity of the cells. Dr Carl Reich established over 25 years of clinical practice, that providing sufficient vitamin D, A, calcium and magnesium with a few trace elements improved the health of the vast majority of his clients. Lack of sunlight contact with the skin therefore undermines our health, rendering supplemental vitamin D essential to maintain health and repair of the body. Our research has shown the most effective way to correct cell Ph (This can be assessed by measuring saliva Ph, shortly after getting up in the morning before any food or drink is taken) is to have a raw food diet employing daily use of cod-liver oil, un-pasteurized raw milk, raw healthy chicken eggs, raw vegetable juice etc, please refer to Dietary Guidelines. Corina from Turkey suffers osteoarthritis in her left hip due to an earlier accident. Corina has used Repair Tonic High Potency Formula. She say's "In 2007 the pain in my left hip was becoming a problem. I was limping and the medical doctor gave a very grim future for me after seeing my x-ray and MRI. I was very upset but wasn't going to follow the medical path of cortisone injections and anti inflammatories. Instead I sought a natural health solution. I searched the net and found Regenerative Nutrition. Their products are amazing. I found that the addition of boron to my health regime had a big impact. Boron is in the Repair Tonic. The best thing is I am pain free, very active and doing all the things I enjoy!" Delia, aged 69 has oesteoarthritis in the hands. She reports "Before I started taking Repair Tonic the joints of my fingers were painful and stiff. My hands would also "lock" when I grasped items. With regular us of the capsules my fingers no longer lock and the pain and inflammation in the joints has virtually stopped. This means I can now use my hands more effectively again and perform short daily exercises to improve the movement in the joints. I enjoy dressmaking and before taking the capsules I was not able to cut out a dress pattern without having to take many pauses due to the discomfort in my hands. My hands still look distorted but they function like they used to. 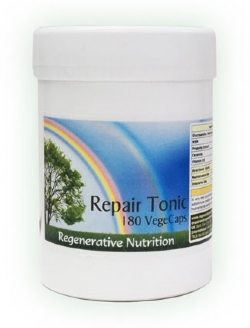 Repair Tonic has rejuvenated me."